In preparation for my recent Alternative Materials in Watercolor and Mixed Media workshop, I had the opportunity to test some great products from Marabu, a company that makes a broad array of art and craft supplies. I used Arches cold press watercolor block for my painting, but any heavy paper would work. I thought it would be interesting to use a stencil to mask out areas (particularly when using the spray) so I used one I happened to have on hand, but you can easily make your own, or block out areas with tape or frisket film. I first made some sketches and notes to plan my painting. I covered my workspace with plastic (I used old plastic bags). 1. I taped down the stencil and used Art Spray to create my background. I sprayed horizontal bands of paint across the paper, starting at the top and working my way down, I overlapped the colors slightly so they blended together. I started with black, then blue, then pink, then yellow. I knew I would paint some trees in the background in the right side, but I decided to remove the stencil before painting that side so that the tree trunk would also have a bit of green undertones in it. I was so excited about my results I forgot to take pictures while I was spraying! Sorry about that! TIPS: For a more even coating, prime the sprayer by spraying into a bag or onto newsprint to clear the nozzle. That will reduce the larger splash marks (like the ones you see in the image above), and give a more even coating. I blotted the extra paint off the stencil with a paper towel so it wouldn’t drip as I removed it. Then I blow-dried the artwork on the lowest setting until dry. 3. 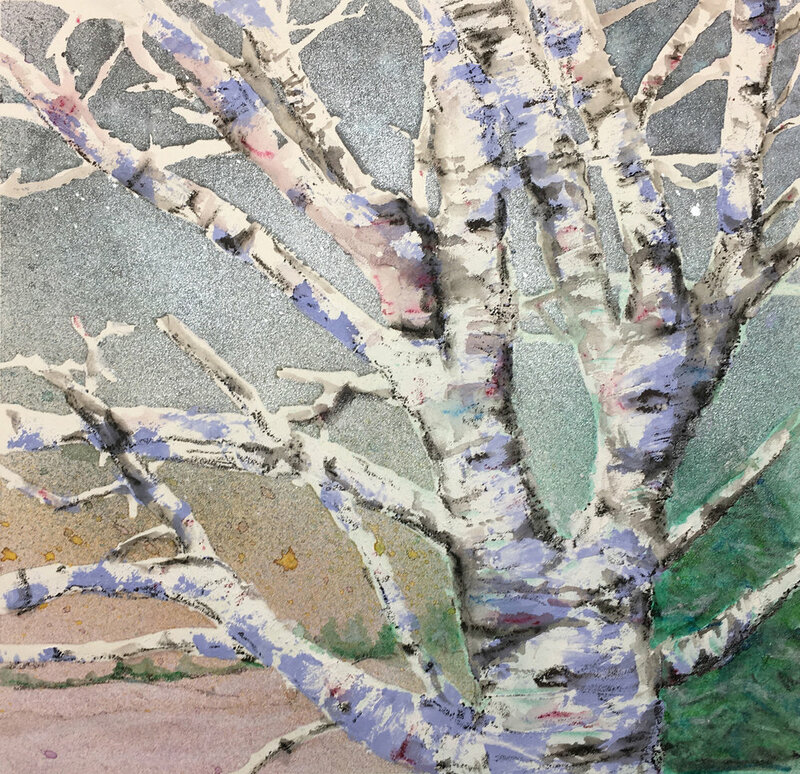 I wanted to give my tree a textured bark, so I decided to try using Acryl Mousse, a white, textured paste that is ideal as a ground for pastel, drawing, acrylic and watercolor. It has a very find, sandy texture and is the consistency of cake frosting. I applied Acryl Mousse to the paper with a spatula, then used a palette knife to create texture. Acryl Mousse spread with palette knife to create bark texture. Notice I let some of the green show through. 5. When the painting was dry (again I used a blow dryer to speed the process), I used black and brown Art Crayons to add some shadows and more texture to the bark. 6. After applying the crayon, I used a wet brush to create washes and soften the texture. 7. Then I added some trees on the right side of the painting and a horizon line with some distant trees on the left side of the painting, then used water to create washes and soften the lines. 8. I wanted to use some silver Art Spray to make the sky look snowy to finish the painting. I taped the stencil back in place, and sprayed the top half of the painting, plus a light spritz on the right side. Pros: I think this material is extremely versatile and could be used in a lot of applications. You can use as a ground on wood, paper, and probably other materials like metal or glass (I would test first). I found that the material accepted both the watercolor washes and the acrylic spray very well. It also works very well to add texture, as you can see in this painting. You can mix it with water soluble paint or inks to change the color, but I found that it started to dry fairly quickly so you would need to work somewhat quickly, or spray it lightly with water to keep it moist. Cons: Just that they dry out a little faster than I would like, but workable time can be improved by lightly misting with water. Pros: These are super fun to use, and the colors are vibrant and blend together very well. By using masks and a little planning, they are a quick substitute for airbrushing. They worked great with a stencil. You could also use them as a fluid acrylic by pouring into a palette and using a brush. I can’t wait to play with these some more! Cons: Not that big a deal, but pay close attention to the directions for clean-up so the nozzles don’t clog. The cleaning process is a little bit tedious, but not so much that I would hesitate to use them. Pros: These are a great tool for adding detail or covering a lot of area in a painting quickly. They adapt well to rough or smooth papers, and are easy to control with water to create washes. They come in a pen-like holder with a cap, and are very soft and smooth to use. They are a great choice for people with disabilities – they are a favorite with those who have limited mobility in their hands because they are larger than other crayons and easy to grip. I have one student with tactile sensitivity, he loves the feeling of how Art Crayons glide across the paper. They are very soft, almost like drawing with lipstick. Cons: Because they are so big, not great for very tight detailed work, but you can sharpen them with a large makeup sharpener if you are working on a more detailed piece. All of these products would be great for kids (with supervision and a little help), but they all have applications for professional artists and are great additions to my art toolbox. If they don't have them stocked at your local art supply store, ask to order them, or you can order online at the major art supply outlets. A big shout-out to Celia Buchanan at Marabu for sending me the samples!